Various DoudouLinux products are now available for purchase. Our non-profit organization Association DoudouLinux manages its online shop, the Doudou Shop, while other organizations start to offer DoudouLinux products on their own. Indeed purchasing DoudouLinux products is another way to support our project and help us continue to develop and improve! We currently offer promotional material and Live DVD’s. 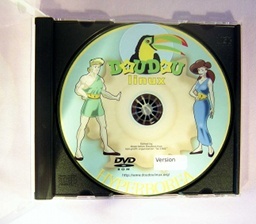 Our DVD’s are designed with the graphical theme of DoudouLinux 2.0 Hyperborea and can be burnt in any of our 44 official languages. Visit our shop, we can ship all around the world! If you want to promote our project around the world, you will probably be interested in purchasing leaflets, stickers and posters. This is a good way to make our project more widely known. Discounts are available for large quantities. NB: If our promotional material is not available in your language yet, please help us translate it! You will find below a list of resellers, the kind of products they sell and the places they can ship to. Note that the products they sell are not manufactured by us but they support our project indirectly. If you sell DoudouLinux products on your own and want to be listed on this page, please contact us. Our association DoudouLinux is retributed for each laptop sold, which is just great :). 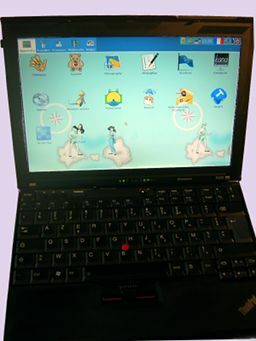 Ecodair can ship to most European countries and operates after-sales service, but, due to keyboard layout limitations, laptops are generally fit for France and, occasionally, some other European countries. Contact them or us if you are interested in laptops with keyboards for other countries.